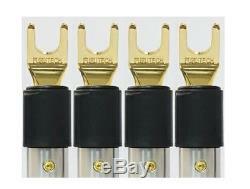 FURUTECH Y plug (1 set 4 units) FT-211-G gold plated from Japan. Specifications conductor: 24K gold-plated (Alpha) pure copper material Housing: Nylon / fiberglass + nano unit ceramic powder and carbon powder finish body insulator: High steel of POM resin molding conductor fixing method: wiring attached by screws maximum wire diameter: 5.5mm wire insulation adaptation diameter: 7.8mm. Choose American Bank or Japanese. Japan Post EMS or YAMATO DHL. Back guarantee for defective products. We never charge you Japanese. These charges are the buyers responsibility. It is based on a company. But it is usually one year. Please feel free to ask questions. We will do our best to answer your question. But please keep in your. Days to answer the question. Which is located in Yokohama. Buyjapan001 = audio products vintage synthesizer musical instruments. International Buyers - Please Note. The item "FURUTECH Y plug (1 set 4 units) FT-211-G gold plated from Japan" is in sale since Sunday, November 26, 2017. This item is in the category "Consumer Electronics\TV, Video & Home Audio\TV, Video & Audio Accessories\Home Audio Accessories\Audio Cables & Interconnects". The seller is "japanceramicfactory*001" and is located in Yokohama, Kanagawa. This item can be shipped worldwide.